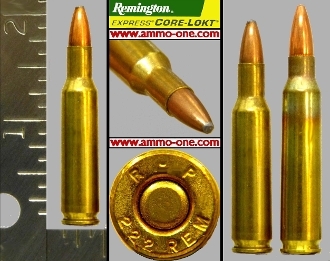 .222 Remington by Remington, JSP, One Cartridge not a Box! Our Products >> .222 Remington by Remington, JSP, One Cartridge not a Box! Pleaae Note: On the above photo on the right (on Left) .222 Remington, (Right) .223 Remington, for size comparison. One Cartridge not a Box: .222 Remington (not Magnum) by Remington Arms Company, USA, factory production using new Remington brass cases with “R-P 222 REM” Head-Stamp and loaded with a 150 grain JSP (Jacketed Soft Point) projectile. The .222 Remington, aka Triple Deuce was introduced in 1950 by Remington Arms Company (as a completely new designed cartridge) to compete against the .219 Zipper by Winchester in a market between the .22 Hornet and .22 Swift. It was first chambered in the Remington Model 722 Bolt-Action rifle. Many other cartridges hace been designed using the .222 Remington case, sure as .221 Remington Fireball,.17 Remington Fireball, .17 Remington and more recently the .204 Ruger. See below in retaed items.